The Shell contains all the processors – up to 12 can be loaded in any order, series and parallel. You can load and save presets for individual modules or globally. The shell also contains the full metering module with Peak, Perceived loudness, Phase, correlation and frequency spectrum metering. Each of these can be adjusted to suit the user. The Shell contains four buttons to AB(CD) 4 complete effect chains along with a “copy to” button. Lastly, at the top-right the compare button allows you to compare your processing to the volume adjustable source. The standalone version adds several more features to the shell. Below the metering section is the playlist. You can drop in all your files to process, or reference. Changing tracks in the playlist will start a new empty chain with all settings saved for all previous tracks. There is a waveform display so you can trim in, and out points and fades. The waveform display is also where you can use snapshot automation for the processing chain. Basically, running T-RackS 3 outside of the DAW let’s you load any number of stereo audio files, process them and export to new files including sample rate, bit depth conversion with dithering. One of the benefits of working in standalone mode is the semi-closed system without access to your hundreds of other VST plugins. You can focus on using the excellent tools available in T-RackS. On the other hand, I already have a pretty good mastering workflow and template in REAPER. One of the things I’ve been doing lately is parallel MS compression which pumps up the RMS level, solidifies the centre channel and widens the overall image. I can do this with the parallel chain but I like having my reference tracks, source track, processed track and parallel effects layer out on faders in front of me. This is beyond the ability of T-RackS shell or standalone. Another trick is to do band-specific upward compression. Kind of like splitting up a multi-band compressor to separate tracks for each range. By using the linear phase EQ (and latency compensation on in the DAW) you avoid the nasty phase shift you’d normally get trying to blend a band-passed signal in with the full-range source. 5 of the 9 processors allow linked stereo, dual mono, and Mid-Side operation which opens up some creative possibilities without the hassle of encoding and decoding manually MS or splitting the tracks to dual mono manually. All the single plugins could be successfully wrapped and used with Automap and my Nocturn Keyboard. There are probably too many parameters in the EQ’s to use automap but all the dynamics modules work great with some hands-on controls. One feature I’d really like is a sidechain input for all the compressors, or at least an internal sidechain filter like the Classic Compressor. The chain I usually start with is Linear Phase EQ, Vintage 670 (Fairchild), Vintage Tube EQ, Classic Clipper, Brickwall Limiter. The Linear EQ is for corrections, 670 is for glue or widening if required, Tube EQ for wide tone shaping. The Clipper and Brickwall Limiter work together to get things loud. I find setting these up first, then jumping back to the corrective EQ to be a good strategy. I’m going to deviate from the review for a second to applaud IK Multimedia for dramatically improving their authorization process. The new Authorization Manager makes online activation very simple now. I’ve heard complaints and fumbled my way through the old method many times and it was confusing. Now, effortless. Thanks IK! The effects are easy to use, map well to controllers and sound great. In the deluxe package you get both clean (opto and classic) compressors, and the colourful Fairchild model. You also get two clean EQ’s (classic and linear) and the vibey vintage Pultec model. The Clipper module is excellent to push up your master levels but it’s also great in the mix where you don’t want to hear a change dynamics or tone but just want to set a ceiling for the track. Kick and snare is where I’m often using the Clipper, the hard knew can sharpen the attack and make it cut through the mix and soft knee is very transparent. I don’t often need a linear phase EQ but when I do, I want something good. The T-RackS Linear EQ is great, so much better than the very expensive Waves ones I’ve used. All the knobs smoothly respond to mousewheel. There are a few areas where I see IK could stand to improve T-RackS, small things but I think they’re worth saying. In the chain view of T-RackS Shell, an easy way to rearrange modules, such as drag & drop, would be nice. Button to open the user guide. There are no tool tips explaining what the various functions do and the manual is actually saved somewhere you won’t find it. Install the documentation to the IK Multimedia/T-RackS folder in My Documents along with the presets instead of hidden in the Mac library documentation folder. Adjustable graph scale for EQ modules. 40dB of gain is far more than you’d ever need in mastering. I’d like an option to limit the graph to +/- 6 and 12dB. I’m interested to see where IK Multimedia takes T-RackS next. The Black 76 and White 2A compressor/limiters are not devices typically found in mastering but are essential rock mixing tools. I’d like to see more classic hardware like the Distressor, Massive Passive, and if we’re going with mixing tools, a Roland Space Echo and EMT Plate. I’d also like to see IK’s take on console and tape simulations which yes, are the thing everyone is doing, but certainly essential mixing and mastering tools. I have no insider info and I don’t want to start any rumours but I would not be surprised to see a couple new additions to T-Racks in 2012. 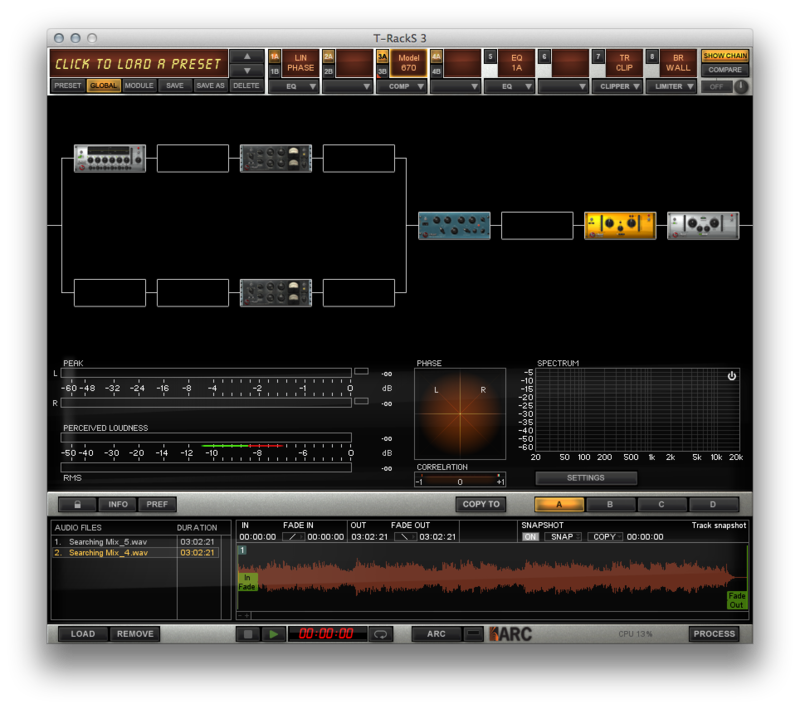 T-Racks 3 Deluxe is an awesome bundle of audio effects for mixing and mastering. At the current promotional price, especially for upgrades, it’s a fantastic deal. The software is a few years old now but still holds up well vs the competition and is still being updated. There is currently a promotion and group buy for T-Racks 3 Deluxe, click here for more details. @theaudiogeek awesome review! I love TRacks and I’m still learning about it. I have Bobby Owsinski’s ebook and it’s great.